Mike Albo is my humor spirit guide. To see Mike perform is to fall in love with a Solid Gold Dancer trapped in an ironic performance poet’s mind who could win a shape-shifting duel with Carol Burnett. To read his writing is to be able to replay his self-deprecating, witty snark for maximum enjoyment since his delivery is often so breathless you can miss his best zingers. To me he will always be the most prolific, ambitious, Brooklyn-before-it-was-Brooklyn authentic artist bohemian. Ever. We met when we both worked for the U.Va. campus newsweekly with aspirations to be The Village Voice. In the early ‘90s we moved to NYC to pursue our media/writing dreams. One emblematic night I recall meeting up at Benny’s Burritos to treat ourselves to the broke English major big night out: we split one of their football-sized burritos so that we could each afford our own jumbo frozen margarita (all for under $10!). Until this point, gyms in NYC were utilitarian-type community centers, but at this time places like Crunch and Equinox were opening and group classes were becoming the THING. While club membership was out of our reach, Mike told me about how he built his own step aerobics set-up at home. 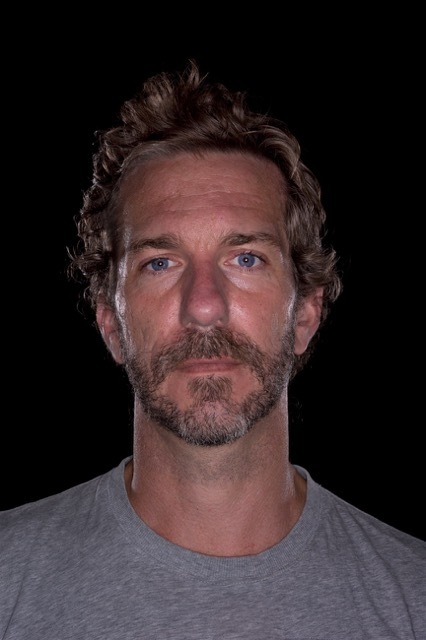 And I realized Mike is the kind of artist who can go the distance–not just because he has superlative creative talents, but because he’s practical enough to apply his creativity to work-arounds that will enable him to survive in NYC’s hostile economic ecosystem. And 20-odd years later Mike’s high-caliber comedic career is a testament to being a survivor of the fittest. His flair for fantastic physical comedy features prominently in his monologues and Unitard comedy troupe sketches. He’s the rare heady humorist who can also Bob Fosse the hell out of a line. This week Mike’s posts will take you on a pilgrimage with him to literal and figurative new frontiers that he has encountered on his creative trajectory–and on his road to spermhood! I mentioned before that I believe ideas are energy. I’d like to expand on that and say that I also think they are gender fluid. I know that sounds weird but what I mean is don’t insist on dressing up your idea in some preconceived notion of what you think it should look like. But even when you settle on a format (a novel, a play, a monologue) you can use the interplay between mediums to refine and revise your work. I am saying this maybe to justify my own process, which is maddeningly multifarious–when I get an idea I think: should this be a comedy sketch? A story? An essay? A poem? Then I spend weeks fleshing it out and giving it shape. Then I usually end up performing what I am writing in some way. I wish I was like Joyce Carol Oates and could just sit down and bang out book after book. Instead, I have discovered that there is a very porous relationship between the stage and the page and I may as well work with it. My second novel (written with the inimitable Virginia Heffernan) was based on a character that we created: The Underminer–a best friend who casually destroys your life. It worked really well onstage, and I kept appearing in comedy shows as the character: at yoga, in a dog run, in line at a party. With the encouragement of my agent, I began to imagine it as a book, and took all the monologues and began reshuffling them, expanding upon them, until I found an evil trajectory for the character and his/her poor victim. The development of my solo show, The Junket, takes an opposite trajectory. I first wrote it as a novella (which is available on Amazon Kindle Singles) and then, working with the director David Schweizer, transmuted it into a full length solo show. In that project, I discovered how much more concise and evocative you have to be on stage. There is no room for digression. And this lesson is very much something I take back to my written work, or at least try to! Of course, there is a difference between a written work and a script, but being concise is universally elegant when it comes to expression. I will be doing my best to remember all I learned as Mr. Schweizer and I prepare to create a solo show out of Spermhood, which is slated to appear at Dixon Place next May. One thing that is never easy: memorizing lines! Eeek! 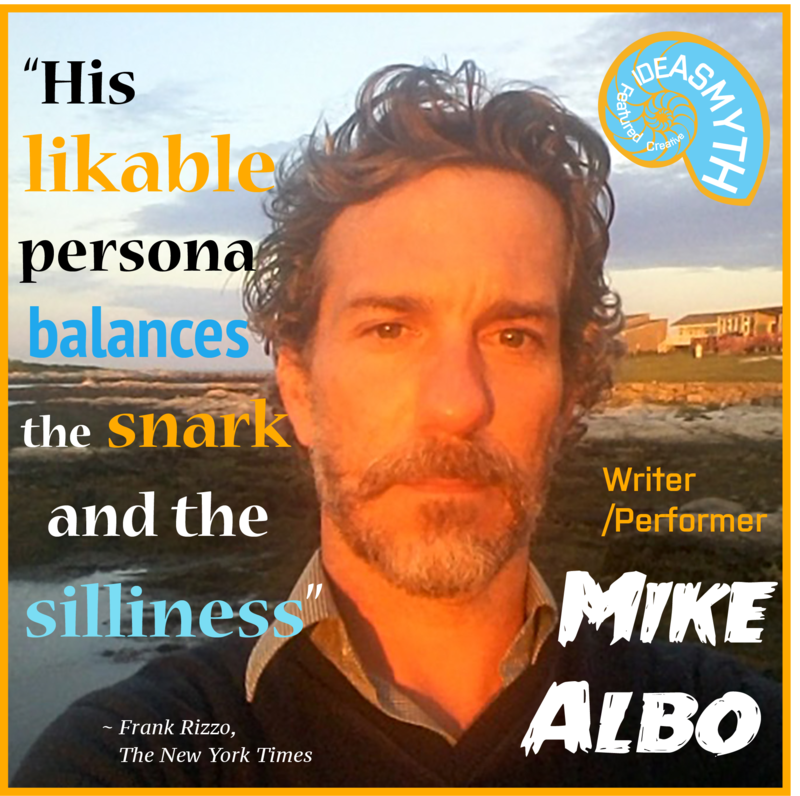 ~~~Mike Albo is a writer, performer, author, comedian, and self proclaimed “thwarted poet”. He is the author of two novels (Hornito, The Underminer), a novella (The Junket), and, because publishing is weird now, an ‘ebook’ called Spermhood: Diary of a Donor, out this month on Amazon’s Kindle Singles. He is also a performer, having mounted 6 solo shows including Spray, My Price Point, and The Junket, which appeared Off Broadway at the Lyn Redgrave Theatre in 2014. He is transforming Spermhood into another solo show, slated to appear at Dixon Place in May 2016. Posted in Book Biz, Book Ideas, Communications, Creative Process, Featured Creatives, Good Ideas, Inspiration, Pilgrimages, Writing, Writing Education and tagged advice, Featured Creative, Mike Albo, pilgrimages, Writing.